Clackamas Fire District #1's Division Chief Bill Conway was honored by Pamplin Media Group and the Royal Rosarians with the Newsmaker of the Year at the Royal Rosarian Newsmakers of the Year Dinner Banquet and Award Presentations on Wednesday, March 21. The Royal Rosarians honored members of the community who have performed exceptional acts of heroism or outstanding humanitarian work without regard for personal safety, public recognition, or personal gain. The recipients were nominated by Portland-area media outlets, and their stories were told in words and pictures by the local news anchors, editors and reporters who first publicized their heroic efforts. Conway was nominated by Angela Fox, publisher of the Clackamas Review/Oregon City News, for his off-duty saving of a man's life Oct. 7, 2017. On Saturday, Oct. 7, off-duty Clackamas Fire District No. 1 Division Chief Bill Conway was in the right place at the right time to help save a citizen's life. Conway and his wife were shopping at Grocery Outlet, 15810 S.E. McLoughlin Blvd., Oak Grove, where they heard what sounded like a case of wine crashing to the floor on the other side of their aisle. After seeing a man on the floor, Conway pushed hard and fast in the middle of the man's chest until paramedics arrived, just as his team has trained 43,000 students to do in hands-only CPR classes in recent years throughout the Clackamas Fire service area. 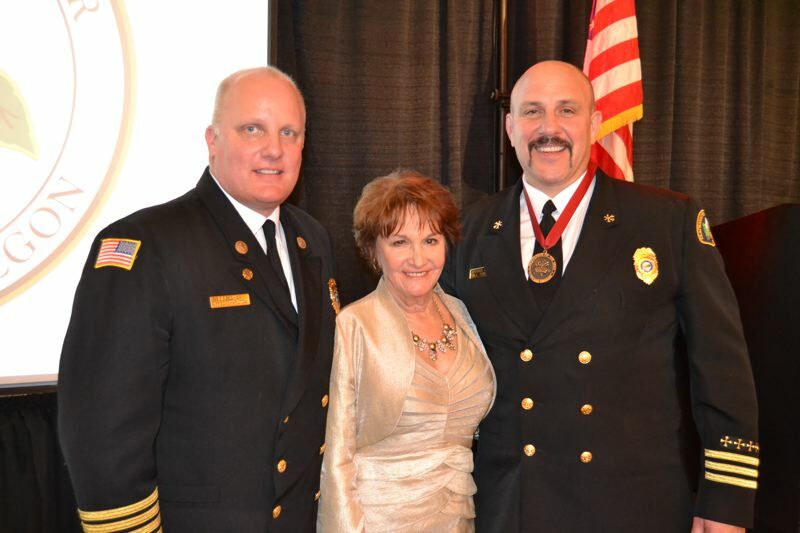 Conway serves as the fire district's emergency medical services chief and has been instrumental in helping citizens learn CPR and in helping find funding for the placement of automatic external defibrillators in law-enforcement vehicles and businesses throughout Clackamas County. The Oct. 7 heart-attack victim turned out to be Jim Jaggers, 71, who retired in 1999 from teaching full-time at Ogden Middle School. After hearing that store employees had called 911, Conway began pushing Jaggers on the chest to the quick beat of "Stayin' Alive" by the Bee Gees. Clackamas Fire firefighters/paramedics and American Medical Response units responded to the scene. They defibrillated Jaggers twice, and he regained a pulse. Jaggers tested positive for a ST-Elevation Myocardial Infarction, a very serious type of heart attack during which one of the arteries that supplies oxygen and nutrient-rich blood to the heart muscle is blocked. Jaggers was then transported to Kaiser Sunnyside Medical Center, and was doing well following triple-bypass surgery. Clackamas Fire Chief Fred Charlton said, "There were only seven awards presented and Clackamas Fire is extremely proud of Chief Conway and our firefighter crew from Oak Grove Station 3 who responded, and the overall success of our hands-only CPR program." Conway said that he didn't perform any special service to Jaggers, noting that thousands of other people in Clackamas County have learned to do hands-on-only CPR under his leadership. He believes that the strength of an entire community fighting side-by-side ultimately will prove to be more powerful than the nation's No. 1 killer — heart disease. He would like to remind everyone that they can be a citizen hero, too, by learning hands-only CPR, calling 911 early, knowing where to find an AED for cardiac arrest victims, and by downloading the Pulse Point app to alert bystanders when a cardiac arrest occurs near them. Newsmakers were awarded a Royal Rosarian bronze medallion and a framed certificate by the organization's Prime Minister. K103- FM morning radio personalities, John Erickson and Bruce Murdock, returned and served as Masters of Ceremonies for a memorable evening where representatives of local media outlets presented their "Newsmaker" or newsworthy story to an audience of over 400 attendees, which included members of the Royal Rosarians.